. 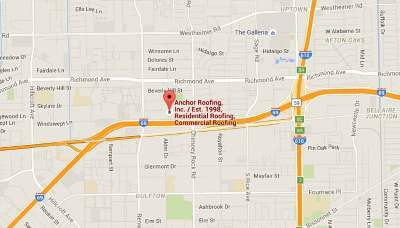 Roofing Contarctors | Roofing Contractors in Houston Texas | Anchor Roofing Inc.
Roofing Contractors is such a broad term that covers every type of Roofing Contractor there is. Realizing that in Texas anyone – literally anyone can be a Roofing Contractor since there is no mandatory licensing often cited as a result of Texas being a Right to Work State it is often confusing for people to determine what type of company or Roofing Contractors that they are dealing with. A good looking website doesn’t necessarily mean they are a good company; however if they appear on the first page of Google organically – meaning they are not a sponsored site that has a paid PPC campaign to be on the top or side of the page as a sponsored site there is very good chance they are a established company / Roofing Contractor that has been around for a while and has a domain that is registered for some time, meaning they don’t plan on leaving. Where as a new site by a Roofing Contractor that hasn’t been around and is only registered for a year could be a Roofing Contractor that changes the name of their company at their convenience. Often the Residential Client may depend on The Better Business Bureau, Angie’s List, or one of many websites to find a referral for a Roofing Contractor often some of the referral sites also take payment for their referrals sometimes, for instance Service Magic is one example; however often these sites can only go off the information they receive about a Roofing Contractor which may not differentiate between a Residential Roofer who only installs Composition Shingles, and a top rated Roofing Contractor / a commercial Roofing Roofing Contractor that installs and is credentialed as a certified applicator for all material types and manufacturer’s, commonly referred to as a Tier One Roofing Contractor. The Tier System is to a Roofing Contractor what a FICA Score is to a common person in terms of their credentials and certified applicator status. The Tier Rating System was developed by Roofing Material Suppliers and Manufacturer’s. Typically you have to earn your Tier Rating, or buy an established company with a high Tier rating that has been in business for some time and established their credentials. What is the highest tier rating for roofing contractors? It is Tier One across the board with all material suppliers. All these suppliers will have certain Tier One Product lines they distribute and have exclusive rights to, for instance of the above listed suppliers only #1 and #4 carry Carlisle-Syntec Single Ply products, and suppliers #2 and #3 carry all lines of Firestone; however no supplier in Houston carries all lines from both. NOTE: not all product lines they carry are Tier One lines as there are too many materials that do not have Tier One Status although they are still great materials that top Roofing Contractors use regularly with pride and assurance of quality. Material suppliers rank their customers, Roofing Contractors by a Tiered System, any roofing contractor that has Tier One across the board with all suppliers has earned that status over a period time, and though becoming credentialed from the Material Manufacturers as certified applicators and often have a good credit history that enables them (Roofing Contractors) to buy materials on credit and set up job accounts for jobs with coinciding payment terms, sometimes 60 days on Commercial Jobs requiring large material orders. When it comes to residential there is some governing and approvals from the shingle manufacturers and other residential roofing product lines as certifying a Roofing Contractor as certified applicator. For example, any Roofing Contractor can buy GAF shingles; however to provide a GAF System Plus Warranty the Roofing Contractor must have Certified Applicator Status. Typically a Roofing Contractor, who has earned the credential of certified applicators by Firestone, and Carlisle-Syntec, are usually considered Tier One Roofing Contractors across the board. 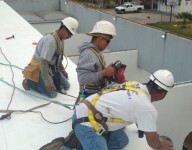 The Tier system is a good way to separate the different levels of Roofing Contractors; however a residential homeowner will not usually be able to find out the Tier Rating of the roofer; however the more lines they have certified applicator status in, the industry associations that they are member of tell a lot about the type of Roofing Contractor. In sum it never hurts to do your research about any Roofing Contractor that you may be using before signing on the dotted line of a binding contract that is usually presented as a proposal by your Roofing Contractor; however it is a legally binding contract typically. 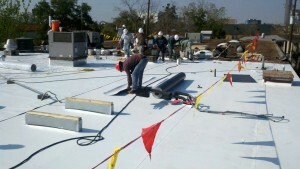 Contact us for roof repair Houston in Texas for reconstruction and leakage for your roof.